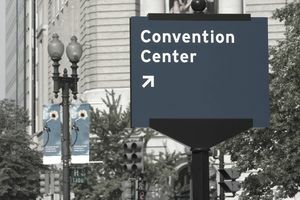 Event planners understand the vital role that good signage plays in getting attendees to and from the wide array of conference offerings. That being said, planning an effective event signage strategy is rarely as simple as creating a handful of directional foam board displays. Whenever you have hundreds of people congregating in an unfamiliar area, you should assume there will be exceptions to even the best traffic funnels. Let’s discuss 5 of the most important considerations to evaluate before settling on your event budget for printing expenses. In this modern era of sponsorship recognition, you’ll often see a breakout room named after a participating sponsor. It makes sense since it is a great way to highlight contributors to the conference. One thing you don’t want to do is override your venue’s room names. For example, if the venue has defined your general session room as Banquet Room 4, then you need to include this information on your signage and programs. Following this protocol will help everyone, from managers to janitors, direct lost attendees to the correct location. Otherwise, a lost soul looking for the creatively named “Gold Room” might get passed off to several people before getting the right information. It is a simple trick that will save you a lot of hassle on the event day. Create a few general direction signs with Velcro arrows that you can change as needed. Some traffic patterns are impossible to predict, and having the flexibility to post directional signage in a pinch can save you from catastrophe. Along the same line, you can also capitalize on Velcro’s functionality to repurpose signage for future events. For example, parking and restroom signs are the types of things you can use for practically every event. A common gripe for event planners is the lack of prevalent event signage provided by hotels and conference centers. The simplest way to get past this is to take responsibility for all the signage needs. It makes sense to take inventory of the in-house options available, but don’t forget that you might have to share some of these resources with other events at the event venue. Branded signs that stand apart from the subtle venue signage are much more distinguishable for your guests. People tend to walk right past house signage, so make sure your brand or logo is displayed clearly to attract attention. Don’t wait for attendees to enter the property before you begin directing them. Entrance and parking signs are critical for making sure attendees park and enter the building at the right spot. Trust me; you don’t want to be the person greeting a registrant who has just walked a half-mile because they parked on the wrong side of the building! A good signage strategy begins at the first place a guest will land on the property grounds. No matter how eye-catching your signs might seem to you, they can never replace the value of a friendly face. Greeters, ushers, and parking attendants will always be the best defense against lost and irritated attendees. Most conference centers offer these services at an hourly rate, or you can enlist volunteers from within your organization. A strategically-placed registration table will alleviate some of the need for staffing, but make sure you walk through the venue property and identify locations where your guests could potentially get lost. The best approach to developing a good event signage strategy is to throw all your assumptions out the window. Every hotel and conference center has some level of stock signage in place, but you should not rely on it as the primary source of directions for your conference. In a world where advertising is pushed on us from every angle, effective event signage has to stand out and capture the attention of your attendees. This can be as simple as including your conference logo on all signs or even more assuring, a designated staff member to smile and answer questions as the guests arrive.